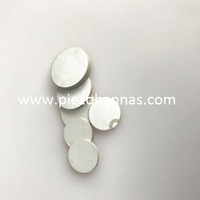 About piezoelectric ceramic driver materials, piezoelectric ceramic displays high requirements on the properties of piezoelectric ceramic materials such as high voltage electrical strain constant, high curie point, high electromechanical coupling coefficient and high frequency constant. 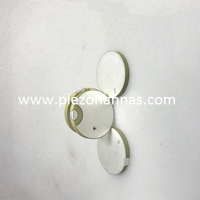 The most widely used piezoelectric ceramic is PZT (lead zirconate titanate) based on Pzt material piezoelectric ceramic transducer because of its remarkable piezoelectric effect, it is high curie temperature, strong radiation resistance, and easy integration with semiconductor integration technology. But it is harmful to the human body and the environment.Therefore, people began to look for lead-free piezoelectric ceramic materials with excellent performance. The most researching lead-free piezoelectric ceramic materials at home and abroad mainly include the following systems: barium titanate-based lead-free piezoelectric ceramics; barium titanate-based lead-free piezoelectric ceramics; tantalate-based lead-free piezoelectric ceramics and tantalum layered structure lead-free piezoelectric ceramics. The research and application of barium titanate (BaTiO3) based on lead-free piezo ceramics transducers have been quite mature. However, the curie temperature of BaTiO3 ceramics is low (Tc=120), the operating temperature range is narrow, and the performance of piezoelectric ceramics are moderate. It is difficult to greatly improve the piezoelectric properties by doping modification, and there is a phase transition near temperature. Therefore, its application of piezoelectric ceramics is limited. Barium strontium titanate-based lead-free piezoelectric ceramic barium titanate and Bi0.5Na0.5TiO3 (BNT) is a typical representative of the titanate series. BNT has the characteristics of relaxed ferroelectrics, which has relatively large remanent polarization and extremely high coercive field (7.5kV/mm), and has a large piezoelectric coefficient (kt, kp about 50%), Excellent performance of dielectric such as small coefficient (240~340) and good acoustic performance (its frequency constant NP=3200Hz). Due to its high coercive electric field and high electrical conductivity in the ferroelectric phase region, polarization is difficult, which is making it difficult to produce practical piezoelectric ceramics. In order to overcome the shortcomings of BNT piezo ceramic polarization and the difficulty of sintering into dense samples, one adds a variety of perovskite structure dopant pairs.BNT is modified. By introducing elements such as Pb, Ba, Ca, Sr, Mn, etc., the coercive field strength of BNT is too high, and the polarization difficulty caused by the high conductivity of BNT ferroelectric phase is avoided, and the polarization of BNT material is successfully solved. The bismuth-based lead-free piezoelectric ceramics mainly include NaNbO3, KNbO3, LiNbO3 and the like. 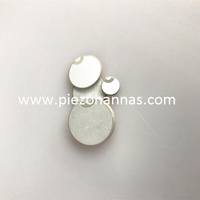 The piezo hemisphere ceramic transducers has the advantages of low density, high acoustic velocity, large mechanical quality factor Qm, large electromechanical coupling coefficient kp, low dielectric constant, high piezoelectric performance, large frequency constant, etc., so the tantalate-based piezoelectric ceramic is a frequency device and preferred material. However, due to the volatility of the metal material, it is difficult to obtain piezo ceramic having good compactness by a conventional ceramic process, which deteriorates ceramic properties. The dense NaNbO3-KNbO3 ceramics can be obtained by hot pressing or isostatic pressing process, and the temperature stability of the material is greatly improved, and the relative density can reach 99%. 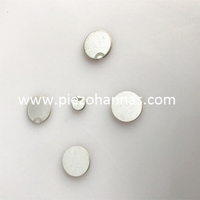 Piezoelectric ceramics ring crystal has low dielectric constant (127~154), strong spontaneous polarization, high curie temperature (Tc>500), high mechanical quality factor Qm (2000~7200), high resistivity and aging rate. Low, easy to sinter, piezoelectric and dielectric properties with high anisotropy and good temperature stability. These characteristics determine that this type ceramic is particularly suitable for high temperature and high frequency applications, thus solving the defect of unstable PZT (lead zirconate titanate) based on piezoelectric ceramics under high power resonance. However, this material has low piezoelectric activity and high polarization field strength. In order to improve the piezoelectric activity of the bismuth layer structure, two methods are generally employed, namely doping modification and process improvement. research shows Incorporating Nb5+ or V5+ into Bi4Ti3O12 can increase the resistivity of the material from 1010~1011cm to 1013~1014cm, and the curie temperature exceeds 650. These properties determine that tantalum piezo ceramics are suitable for high temperature sensors, oscillators, and actuators. In summary, from the performance of the existing lead-free piezoelectric ceramic material system, the lead-free piezoelectric ceramics of bismuth silicate and bismuth layer structure have great development potential, excellent piezoelectric performance, which can satisfy piezoelectricity. The requirements of piezo ceramic displays are expected to replace lead-based piezoelectric ceramics and become the choice of piezoelectric ceramic. In practical applications, some inherent characteristics of piezoceramic cylinder ceramic transducer(such as hysteresis, creep, etc.) have a great impact on high-precision displacement control. In order to reduce the influence of hysteresis of piezoelectric ceramics on displacement output, foreign scholars have proposed many compensation methods. At present, the method of eliminating hysteresis is generally closed-loop control in the control process. This mode requires an additional displacement sensor to measure the displacement and compare it with the target displacement of the controller to form a complex control adjustment mechanism. Under the action of alternating electric field, ultrasonic polarized piezo transducers will exhibit macroscopic ferroelectric degradation due to the decrease of ferroelectric domain wall activity. Micro-cracks, delamination or fracture often occur the material and field-induced fatigue. The intrinsic reason is mainly due to the difference in the interface with properties. 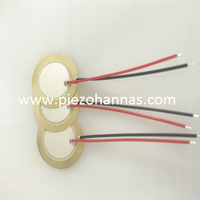 The thermal expansion coefficient at the interface between the piezo ceramic and the electrode is different or there is a chemical reaction, which adversely affects the fatigue performance of the piezoelectric ceramic. The interface bonding force is greatly improved by incorporating the electrode powder into the ceramic material or incorporating the ceramic powder and the original electrode. Electric field and temperature are the main external factors that affect fatigue performance. A study of two factors can be found that the field is stronger than the coercive field strength or the frequency is high, which will cause electrical fatigue. In addition, in a certain temperature range, the fatigue resistance increases with increasing temperature. When the temperature exceeds a certain critical value, the material enters the paramagnetic phase and the fatigue phenomenon disappears. (3) At present, field-induced fatigue research mostly focuses on the electric field and temperature field , but the research on the field under multi-field coupling is lacking, but the actual piezoelectric ceramic devices work under multi-field coupling conditions, so it is necessary to strengthen the study of the field-induced fatigue mechanism under multi-field coupling.